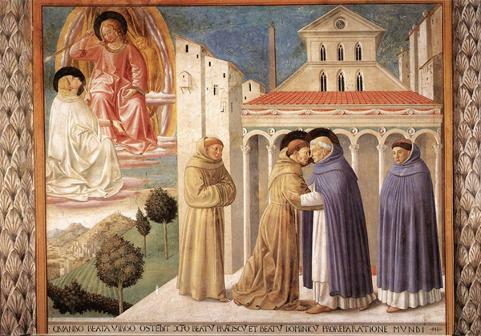 This picture shows the Meeting of St Francis and St Dominic. The artist, Benozzo, starts with the vision of St Dominic in the left half of the picture. Christ is about to hurl three spears - the symbols of pride, unchastity and greed - at the depraved world. Mary is attempting to prevent him by pointing to the meeting taking place between St Dominic and St Francis. The depiction of the saint is derived from the description written by Thomas of Celano in 1228: "Not particularly large in form; small rather than large, he had a not particularly large, round head, a somewhat long and stretched face, a level and low forehead, not particularly large black, pure eyes, dark hair, straight eyebrows, an even, fine and straight nose, upright, small ears, flat temples (...), close, regular and white teeth, narrow and soft lips, a black, not full beard, a slender neck, straight shoulders, short arms, gentle hands, long fingers." For the first time in this cycle St Francis bears a tonsure and is dressed in the simple brown habit of a Franciscan, with a cord as a belt. This plain habit clearly distinguishes him from St Dominic, whose habit is a white tunic with a white scapular with a dark cape over it. In contrast with the rather more lavish Dominican attire, St Francis' simple habit refers to the ideal of poverty to which he dedicated himself for the rest of his life. The two founders of orders met in Rome, as indicated by the obelisks which appear on the left side of the church. Benozzo places the scene, which according to legend took place in 1215, in front of a church, presumably Old St Peter's. This scene is not drawn from the legend of St Francis but from the life of St Dominic in the "Legenda Aurea" (Golden Legend). The accompanying inscription reads: QUANDO BEATA VIRGO OSTE(N)DIT XPO BEATU(M) FRANCISCU(M) ET BEATU(M) DOMINICU(M) PRO REPARATIONE MUNDI - "How the blessed Virgin pointed St Francis and St Dominic out to Christ, for the renewal of the world." This picture concludes the bottom row of the pictures on the right southern wall.